A previous post showed a tactic missed in a TL game. *However, this just reveals how fascinating a game chess is, or perhaps more accurately, how incredibly intriguing people, their history, and motives are ! This entire game "could" be a fabrication by Alekhine, albeit based on his own analysis of the play arising from the earlier moves of a consultation game that occurred in 1941 ! The losing player would appear not to be Muñoz ( based on good deductions ), but cannot be identified at this point. See the always interesting Edward Winter in Chess History for the full information. The Holmesian in me also likes his reference "There is also the dog that failed to bark in the night argument" although that actually comes via Leonard Barden's notes that Winter quotes. I found this via an interesting blog called mccreadyandchess, that was new to me : mainly chess, but a few other things thrown in as too. Here you go, a documentary on chess from 1986, created by Bill Hartston, once the "go-to" commentator and observer for the British media, when they were fascinated by the goings-on in the chess world, but needing an informed guide through it. I have to say Tal looks very creepy (those eyebrows, that look ! ), and Spassky performs an amazing vocal imitation of a squeaky Karpov, and that it reminded me that lots of men in the 80s wore jumpers under their suits or jackets ! Fischer's is the least " American-sounding" American voice I have heard for a long time, but I recall having that thought before about American voices from the 40s, 50s and 60s. Enjoy, I certainly did ! I've used these few posts as a reminder on missed tactics, in that I can view the post and work out or remember the combination. 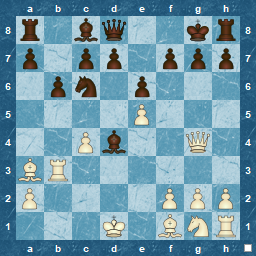 An ongoing discussion : is blitz chess really " chess" ? In the end that depends what you believe "chess" is, and why you play blitz chess. It has its place, and taken for that it is useful/fun/relaxing/etc, in its way..
Subjectively, as White I have lost, as I have two pieces en prise, and few prospects. If this was a proper "chess" game, I would either resign immediately, or play a few moves just to see how Black would tie this up. 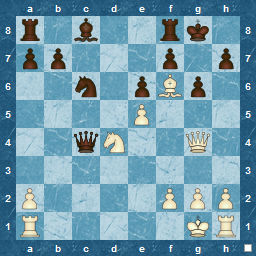 However, it is blitz, and the chess part of my mind tells me that " If that Black Knight wasn't on d7, then Qf8 is mate , or if my knight was on f5, and the Ng8 was gone, then Qd7 is mate" so luck and psychology could play a large part here. I reason that Black could think that he has won the knight(h4) and/or the rook(b1) easily, so may well be inclined to be focusing on either of those ( most likely the higher-valued Rook ) rather than white's remote mate threats. Nf5 is not a move likely to succeed, since the pawn will snap it up and there are still two pieces en prise. So, how to remove the guarding knight ? 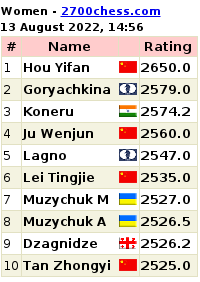 It seems obvious that d5 is the only move to play. 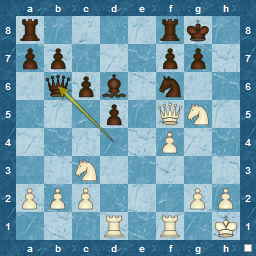 Not much threatened directly, but if Black is one who reacts to an immediate threat, maybe he will capture, and exd is more likely than cxd ( since that allows Qxb5 ), or it may even be dismissed as a distraction to the real meat of the hanging Rook or Knight ? 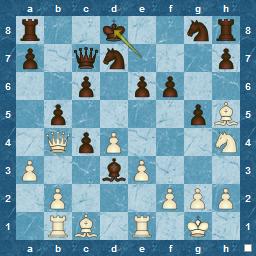 If the e-pawn captures then Nf5 is possible. The response is an expected material gain : Bishop takes Rook ! I play the pawn capture, dxe . Black immediately responds Ne5, and loses to Qf8 mate ! Yes, its a swindle, but I feel very happy to have won, and by such a " devious" method, plus I have exercised my tactical brain a little, spotting two possible mates, and being rewarded, courtesy of a greedy attitude, with one of them ! An example of how an amateur mind works ? human psychology ? or just blitz chess ? White has a great opportunity presented to him, after Rd1 chases the Queen away...do you see it ? Unfortunately, White missed the clues, and played Nce4, to exchange pieces,and lose the advantage.